It will be a debut of old and new when the defending NFC North Champion Minnesota Vikings take on the Denver Broncos on Saturday in both teams’ 2018 NFL preseason opener. The Vikings found their quarterback of the next few years after signing Kirk Cousins as a free agent back in March subsequent to the quarterback spending his first six NFL seasons in Washington. Likewise, the Broncos inked their new quarterback (and former Vikings quarterback) Case Keenum to a two-year, $38-million deal after it was clear that Minnesota was fixated on Cousins. Although the reunion only figures to last a series or two, emotions will be running high for both teams and their old and new signal-callers alike. While Cousins’ 2017 season (78.7 overall grade) might not have warranted such a lucrative contract from the Vikings, his play in years prior suggest that he is certainly capable of top-tier performances – most notably his 2016 season which saw him rank inside the top 10 among quarterbacks with an overall grade of 85.4. Cousins will be joining our top-rated wide receiver corps in the NFL – a cast that features two PFF top-10 graded receivers in Stefon Diggs (85.4) and Adam Thielen (84.6). Additionally, both Diggs and Thielen finished in the top six last season in contested-catch rate, proving that they have a habit of making their quarterback look good. Throw in Kendall Wright (the Bears most productive receiver last year) in the slot and it will be no surprise to see Cousins make it four straight years with over 4,000 passing yards. With what has been a conservative offense based on efficiency and low-risk taking in terms of passing the last few seasons, having Cousins’ gunslinger mentality under center will most certainly produce more big plays for the team. That said, it could very well produce more turnovers also. 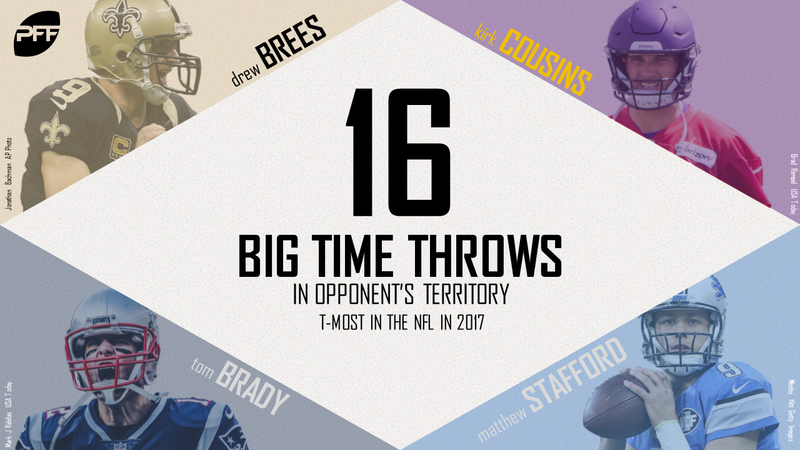 Cousins had plenty turnover-worthy plays that haunted the Redskins’ offense in 2017. Although most areas of Cousins’ game have been boom or bust over the course of his career, not only does he have the top-rated wide receiver corps in the NFL heading into 2018, he will also be backed by an effective run game that fashioned over 1,750 yards of offense just a season ago, as well as an offensive line that ranked in the top-half of the NFL in terms of pass-blocking efficiency (79.3). Furthermore, if the last three seasons of quarterback production from the Vikings (Teddy Bridgewater 2015, 82.1 grade; Sam Bradford 2016, 83.4; Case Keenum 2017, 85.3) are any indication of what’s to come in 2018, it’s safe to say that Cousins’ play – despite his inconsistencies in Washington – will likely be more ‘boom’ than bust like in years past. Broncos’ quarterback Keenum played a nearly perfect year in 2017 while leading the Vikings to the NFC Championship game. Although he will be downgrading from Minnesota’s 13th–ranked pass-blocking offensive line (79.3 pass-blocking efficiency) to Denver’s 30th–ranked line (75.1 pass-blocking efficiency), he will still have the benefit of working with big names at wide receiver like Demaryius Thomas (75.3) and Emmanuel Sanders (70.7). While the upside of Keenum is certainly less than that of Cousins, there is no doubting Keenum’s most valuable quality – his efficiency. Keenum finished 2017 as a top-10 quarterback in both overall grade (85.3) and in nearly every other quarterback metric that PFF tracks, including passer rating when kept clean from pressure, a metric proven to be more stable of year-to-year success in the NFL. While both Cousins and Keenum will only see limited (if any) action on Saturday night, the story behind the ‘old’ and ‘new’ quarterbacks will make this one fun to watch. 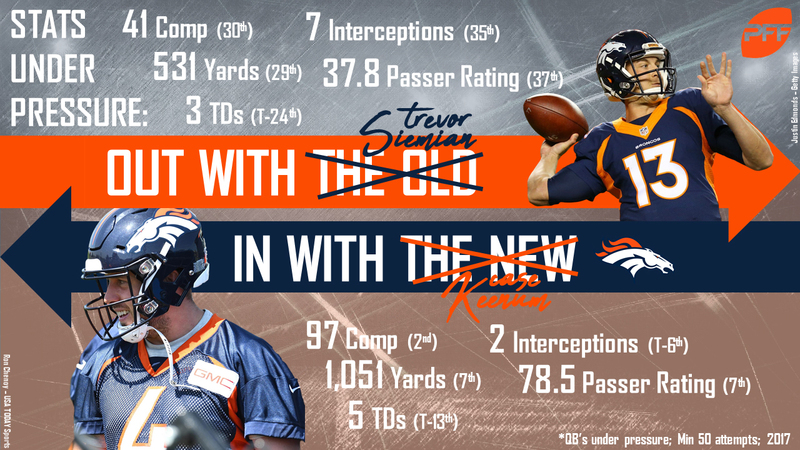 As if the drama surrounding the starting quarterbacks for these two franchises weren’t enough, the newly-acquired backup quarterback for the Vikings and former Bronco, Trevor Siemian, figures to see a large portion of the reps in in the preseason opener against his former team. After starting the season for Denver last year with a 76.7 grade against the Chargers, Siemian’s play fell off drastically, finishing the year with a 53.2 grade, as the Broncos couldn’t overcome the poor play from under center. Siemian, now with a change of scenery, will look to compete Saturday against a familiar face: quarterback Paxton Lynch. As for the Broncos, after trading Siemian and a seventh-round pick to Minnesota for a 2019 fifth rounder, the team will look to Lynch to win the backup job (although he is being pushed hard by Chad Kelly). In 2016 when both Siemian and Lynch saw time for Denver (Lynch had only 83 pass attempts that year), Lynch was dramatically outperformed by his counterpart – Siemian had a better passer rating when under pressure (61.6), passer rating on deep balls (84.2) and passer rating on play-action passes (85.4). So, once again, for better or for worse, it will be Siemian vs Lynch all over again come Saturday night. To make matters even more interesting, Kyle Sloter – the darling of the Broncos’ preseason last year – was picked up by Minnesota after being cut by Denver despite his impressive preseason performance. In four preseason games for Denver in 2017, Sloter shined, throwing for 413 yards, three touchdowns and no interceptions to go along with a 125.4 passer rating. Minnesota promoted Sloter to the active roster early in 2017 after Bradford went down with an injury and although he never threw a pass last season, he did serve as the No. 2 quarterback for a stretch – possibly a sign of the Viking’s comfort level with him. It will be intriguing to watch the preseason stud take on his former team and push Siemian for the No. 2 spot. The Broncos have a similar situation with their third quarterback. Kelly has looked sharp this offseason and it’s not hard to imagine him outperforming Lynch should he get some time with the second team. Kelly is a gunslinger who thrives when making throws on the run and isn’t afraid to take shots deep. It wasn’t that long ago in 2016 when Kelly finished second in the nation in deep-ball accuracy only behind Mason Rudolph. Speaking of his 2016 season, Kelly faced off against two first-round prospects that year in LSU’s Tre’Davious White and Alabama’s Marlon Humphrey. Against White, Kelly threw into his coverage six times and completed five passes for 77 yards and a touchdown, fielding a perfect passer rating of 158.3 against him. When he faced Humphrey, the former Ole Miss quarterback threw into his coverage eight times, completing five passes for 141 yards and a touchdown to garner a passer rating of 145.8. Even though Saturday’s preseason game in Denver means little in the long run, it will certainly be symbolic of both teams putting last season behind them when Cousins and Keenum lead their teams onto the field for the first time. And although the two storied quarterbacks won’t see much action, the stories don’t end with them – the second- and third-string quarterbacks on both teams are as storied as any in the league and will have plenty of motivation to look sharp come Saturday.